An anonymous comment to our survey pointed out that two (of the four) pictures we’ve posted so far include skinny white women in bikinis, and that no one else is represented. This is totally fair enough, and we’re embarrassed to have given that impression — we were focused on picking the pictures that gave the best views of the tanks, and didn’t pay enough attention to other messages that might be present. We don’t yet have our own tanks, so we’re at the mercy of stock photography here. Once you’re in a tank, you’re alone with yourself, in pitch dark. What you look like could hardly matter less. “The simple act of floating in warm salty water is the most relaxing experience on Earth.” That’s the motto of Floataway, one of the pioneers of the float industry. A float tank manufactured by i-sopod. A float tank, or float pod, is a small, enclosed pool usually just big enough for one person to lie down in. The water is less than a foot deep, but has so much Epsom salt dissolved in it that it’s more dense than the Dead Sea — each tank contains 800 to 1000 lbs of salt! You float effortlessly, even in such a shallow depth. Epsom salt is used to provide buoyancy, rather than normal sea salt, to avoid the itchy wrinkly pruny effect that comes with long immersion in the ocean. The high concentration of salt does sting quite sharply if it gets in your eyes or nose, but it’s easy to float with your face out of the water, and a freshwater rinse is provided to clean up if you touch your face without thinking. The pool is heated to skin temperature, so you get neither hot nor cold, and it’s enclosed to block out as much light and sound from the outside world as possible. The roof is high enough that you can still sit up comfortably, but otherwise you are snug in the most womblike possible environment. With the sounds of the outside world removed, you are left with your own breathing, and heartbeat, and the occasional splash if you move around. What does this do? There are fairly profound physiological and psychological effects. You float effortlessly, so the body is relieved of any need to balance itself against gravity or keep any tension in the limbs. You can relax completely. Also, unlike lying on a bed, none of your tissues are compressed, allowing blood to flow freely. Epsom salt baths have a long history in spas, where they are thought to help soften skin and relieve muscle tension. Scientifically, Epsom salt is magnesium sulfate, and many people also believe that the magnesium can be absorbed through the skin. Magnesium is known to be important in a long list of critical biochemical reactions, and it is common for people to be deficient. The float tank is designed as a reduced stimulation environment. In fact, that’s the accepted scientific term: Reduced Environmental Stimulation Technique, or REST. Inputs to the cerebral cortex are dampened or eliminated: vision, hearing, touch, proprioception, motor movement and verbal control, thermal sensation and regulation. With the noise of all that normal activity dampened, you can become much more able to hear your inner world. The sensation is somewhat like falling asleep, except that you can sustain that floating state for extended lengths of time. Some people report going so deep that they have visions, mild auditory hallucinations, and out-of-body experiences. One way to think of it is that flotation provides the most conducive possible environment for meditation. Most people are able to access a trance state within a few sessions, sometimes even the first time, with no training or practice whatsoever. Whether you experience any altered consciousness or not, the float tank environment is extraordinarily relaxing. Our society is suffering something of a stress epidemic, and stress is recognized as a risk factor for every leading cause of death. More than two dozen studies have shown flotation significantly reduces anxiety, eases depression, helps sleep, and decreases blood pressure. Investigation is ongoing to its use as a therapy for PTSD. Many people experience relief from muscle pain, both acute and chronic. For instance, there is an ongoing study of its use as a therapy for fibromyalgia. The flotation state also seems to have benefits for creativity and mental focusing. Various studies have shown improvements to memory, idea generation, competitive performance (such as target rifle shooting), and lasting behavioural changes such as losing weight or quitting smoking. Note: this essay includes a whole lot of comments about “various studies” without links to the science. I am working through the research, and will update each topic as I get to it. Some people have concerns that they will experience claustrophobia in a tank, but this is rare. It’s bigger than you think — big enough to sit up in easily — and you are not locked in. The door is very light, and does not even have a latch. Some people find it helpful to leave the door ajar, or fully open. That’s okay. There’s no pressure. If you’re interested, encourage us to open near you! Fill out our location survey and join our mailing list. What’s going on right now? Well, we are busy reading and learning and chipping away at all the tasks that need to be done when preparing to open a business. The two big projects right now are: 1) the business plan, so we know how much money we need; and 2) the variance request I need to submit to the Board of Health. Basically, the state sanitation code mentions float tanks as a “special purpose pool,” but the regulations are clearly written for hot tubs and other hydrotherapy. In order to get a permit, we must demonstrate that the changes we propose make sense, and also that safety and sanitation remains our priority. We’re also in touch with a commercial leasing agent to check out available space around here. 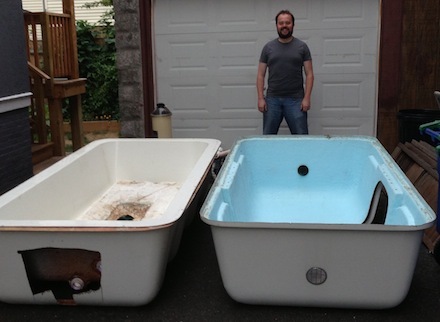 We want FLOAT to be in Somerville – we live here, and love it – but we’ll see what’s out there. p.s. Colin and I will be at the Float Conference in Portland OR next month. We can’t wait!